This girls night in pamper kit with creamy Galaxy® chocolate is presented in a bright pink gift box with a magnetic lid, it is lined with pink and ivory tissue paper, the contents are then carefully added and the gift box is tied with pink ribbon finished with a pink spotted bow. 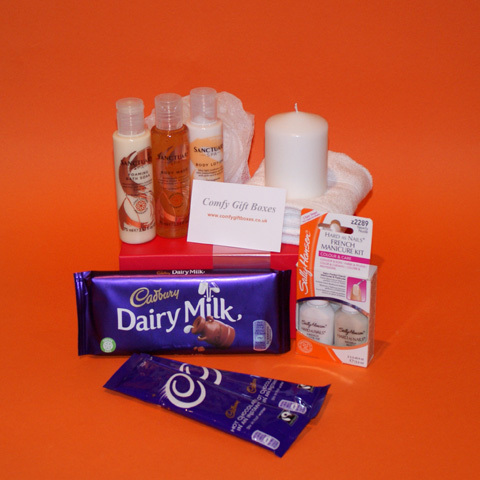 The night in pamper kit gift ideas below include Cadbury Dairy Milk and Maltesers® chocolates or come without chocolate, they make great birthday present ideas and surprise gifts for her. Presented in a bright pink gift box with magnetic lid and pink spotted bow. Presented in a silver gift box with matching lid, pink ribbon and a bright pink bow. Presented in a mango gift hamper tray with transparent lid, ivory ribbon with a hand tied satin bow.